As a customer, there are a few things you need to know about your newly purchased reclaimed wood flooring or paneling. Wood is hygroscopic, which means it attracts water based upon the conditions it’s presently in through absorption or adsorption. This results in wood arriving to your location potentially at a different moisture content than what is required for your installation. In order to make your flooring or paneling look and feel its best, you need to acclimate it. Wood naturally has certain levels of water in it at all times. This is nothing to worry about so long as you treat the wood correctly. Acclimating is one of the most significant things you can do to attain the best looking installation possible. Acclimating is when you allow the wood time to adjust its moisture content to the environment that it will be installed in. Failure to acclimate both engineered and solid wood flooring may result in cupping, warping, gaps and splits before, during, or after installation. First and foremost, consult with a licensed professional installer before installation of the flooring/paneling material. Upon receiving your material, you should take moisture readings using a moisture meter to establish the moisture content (MC), and visually inspect boards for defects from each box including boards from the top, bottom and middle. A good rule of thumb is to inspect 40 boards per 1,000 square feet. 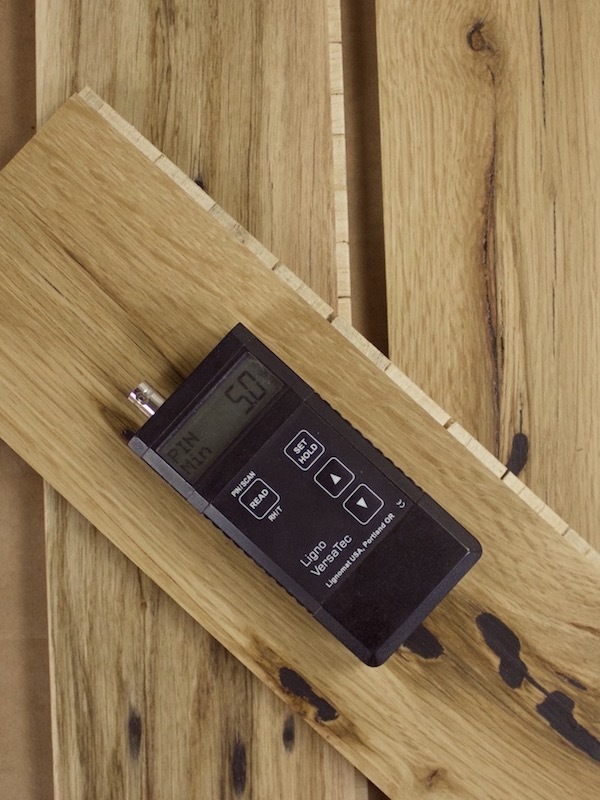 When inspecting both solid and engineered flooring/paneling, remember to check the seasonal variation of wood moisture content for YOUR specific geographical region by consulting with the National Wood Flooring Association. Make sure to establish the average low and high MC and then divide the two in order to determine your optimal MC. Go here and scroll to page 45 to find your area. Example: If your region has a low MC of 6% and a high MC of 9%, your optimal MC would be 7.5%. In this example, if your flooring/paneling arrives and is lower or higher than 7.5%, you would need to store the wood as to close to the installation environment conditions as possible and retest until the wood reaches the 7.5% you need. If the material arrives at a significantly high MC or you are installing in an extreme environment, you need to increase acclimation times. STORAGE - Ensure your product is stored properly. Flooring/paneling should be stored in a clean and dry location with the product still properly wrapped. This includes storing for short periods of time. All flooring/paneling should be stored on a solid flat surface that is properly supported with blocking evenly spaced no further than one foot apart along the length of the units (preferably not directly on the floor) to prevent warping. This is essential for engineered flooring which tends to be thinner. ACCLIMATING – Please keep in mind that different wood species take longer than others to acclimate. Tropical species have been known to take longer than domestic species so consideration should be taken when planning your installation. When acclimating solid wood flooring/paneling, make sure the product is flat and boards are separated and cross stacked evenly with same size 3/4” - 1” stickers, spaced evenly, to allow for adequate airflow. When acclimating engineered flooring/paneling, the National Wood Flooring Association recommends the material remain in the box with the box ends opened. Remove a few pieces from top, bottom and middle of the box to sample the moisture content. Replace these pieces back in the box and close the box, while still keeping the box ends open. CHECKING MOISTURE - When checking for moisture during acclimation, the type of moisture meter used can determine the level of accuracy. Follow all of the manufacturer’s recommendations to ensure proper use of the moisture meter. There are two common types of moisture meters. Pin style meters require multiple testing points along a board depending on the finish coating. Care should be taken when using this style of meter to avoid damage to your surface finish. Pinless meters typically have depth adjustment that can be adjusted to provide a more accurate reading. This should be considered when checking MC. Make sure to check the MC of the installation surface (walls or subfloor, including concrete) in at least 20 points every 1000sq ft. Failure to do so might jeopardize the entire installation. Please consult a professional installer regarding the type of subfloor and possible need for a moisture vapor retarder. Flooring/paneling must be at the MC for your geographic area and be within 2-4% of the subfloor’s or existing wall sheeting’s MC. Be sure to check the moisture near windows or plumbing. These areas may have higher out-of-range MC readings that will affect the performance of your material. ENVIRONMENTAL CONDITIONS - Last but not least, ensure your HVAC system is running at least 5 days prior to installation at the proper settings for desired temperature and humidity. This will allow the humidity to stabilize in the room your new flooring/paneling will reside. Ambient air humidity should be between 35% and 55% assuming the room is between 60° to 80° Fahrenheit. If your humidity or temperature is out of spec, postpone your installation. Failing to do so may cause the room to have an improper moisture content that will cause failure. These conditions must be maintained over the life of the product. These are guidelines only and are superseded by the expertise and guidance of the National Wood Flooring Association (NWFA) as well as your professional and knowledgeable flooring and paneling installer. For more information, or if you have additional questions, please consult a licensed professional or consult with the National Wood Flooring Association (NWFA) prior to installation.